I had the pleasure of visiting Ketchum this weekend to talk with the folks there about the Aug 21 solar eclipse. Ketchum is near the southern edge of the path of totality and so will experience an eclipse a little longer than a minute. On the way, I visited the Craters of the Moon National Monument, site of one of the youngest flood basalt fields in the world, young enough that it may erupt again. The spindle bomb on display at the Craters visitors’ center. 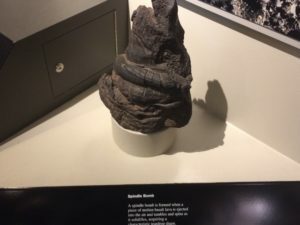 Among the exhibits in the visitors’ center, I found a display describing the spindle volcanic bomb – a chunk of lava that supposedly flew through the air while molten and froze out into a twisted and stream-lined shape as a result. After being chased off one of the cinder cones by a surprise rain storm, I piled back into the car and continued on to Ketchum. When I got there, I met Alisa Sergeyeva, a staff member with the Ketchum City Hall who had invited me to speak, and we set up for a presentation on the beautiful town square. From my perspective, the talk went well (although we had to improvise a bit since my powerpoint presentation was difficult to see in the Sun) – lots of laughs and questions from the hundred or so attendees. 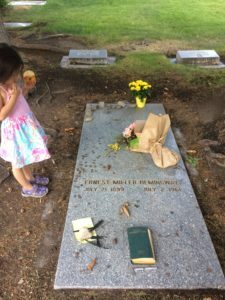 After the presentation, I set up the Coronado solar scope to do some sungazing and then a short pilgrimage to the Ketchum City Cemetery where, Alisa explained, Ernest Hemingway is buried. By way of a remembrance, I stopped off at The Sawtooth Club, supposedly a Hemingway haunt, before heading back to the hotel for the night. I posted the presentation I gave below. Posted in: Brian's Presentations. Tagged: drones, dust devils, UAVs. On the morning of August 21, 2017, a total solar eclipse will be visible across the continental United States. The Moon’s shadow will also pass through Idaho, and visitors from all around the world will flock to our state. Join the Boise State Physics Department in the Multi-Purpose Classroom Building on Aug 4 at 7:30p to learn more about this historic event and how to view it safely. After the presentation, we will distribute eclipse shades and do some stargazing on top of the Brady Street Parking Garage. This event is free and open to the public. No need for reservations. Posted in: Public Outreach. Tagged: supernovae. 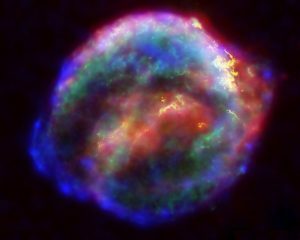 A supernova is an astronomical event that occurs during the last stellar evolutionary stages of a massive star’s life, whose dramatic and catastrophic destruction is marked by one final titanic explosion. Join the Boise State Physics Department and Prof. Irwin Horowitz from College of Western Idaho to learn about the theoretical understanding of the most violent and energetic events in the universe as well as the observational support for these models and see Dr. Horowitz “blow up a star”! The event will take place on Friday, July 7 and start at 7:30PM in the Multipurpose Classroom Building, room 101 on Boise State’s campus. After Prof. Horowitz’s presentation, we will head to the top of Brady Street Parking Garage to stargaze. What will the partial solar eclipse look like? UPDATE (2017 Aug 2) – I’ve had more than person ask whether they’ll be able to see the solar corona, the tenuous and very hot outermost layer of the Sun’s atmosphere, during the partial eclipse in Boise. I believe the answer is no. This website indicates that the corona is a million times dimmer than the Sun’s photosphere. During the darkest part of the partial eclipse in Boise, the photosphere, the part of the Sun we usually see, will be 200,000 times dimmer than usual (see below). So my guess is, from Boise, not enough of the photosphere will be occulted to reveal the corona. Millions of people will travel from around the world to observe the total solar eclipse on August 21 in the path of totality, a band extending across the US in which the Moon will completely occult the Sun. Everyone NOT inside that path will observe a partial solar eclipse, and the closer you are to the path of totality, the darker your partial eclipse. During our statewide tour talking about the eclipse, I have been asked again and again “Is it worthwhile trying to get to the path of totality?” The honest truth is that there are some aspects of the eclipse that you will miss out on if you don’t get to the path of totality. BUT getting to the path of totality can be difficult – in Idaho, there are reports that all hotels and campsites are booked up, and driving to the path on the day of the eclipse will probably involve sitting in traffic for many hours. So travelers should be prepared with food and water. So what will you see if you CAN’T get to the path? You can still enjoy a nice eclipse, but you MUST use eye protection during the ENTIRE eclipse. Staring at a partial eclipse at any level can permanently damage your eyes. Eclipse shades, the best way to safely observe the solar eclipse. What will you see during a partial eclipse? That depends on where you observe from. For example, Boise is just south of totality and will see a partial eclipse with 99.555% obscuration (check out this amazing map to see eclipse conditions anywhere in the world). That means the Moon will block all but 0.00445% of the Sun’s disk, making the Sun more than 200,000 times darker than usual. So what will that look like? 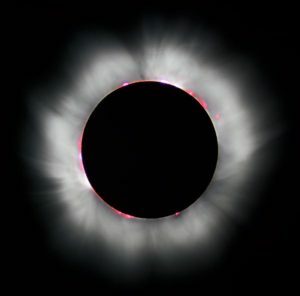 The visualization below shows an approximation as seen through eclipse shades. As one-two-hundredth its normal brightness, the Sun will appear a little dimmer than the sky at twilight* and about ten times as bright as the Sun normally appears from Pluto. What a 99% partial eclipse looks like through eclipse shades. From http://americaneclipseusa.com/seeing-the-eclipse-from-home/. At this level, though, you probably won’t be able to see the solar corona, and other eclipse effects will be substantially more muted. But for those who can’t take off of work or skip school – August 21 is a Monday, after all – the partial eclipse viewed from near the path of totality will still be a once-in-a-lifetime event. *At 0.00445%, the usual solar flux (1300 W/m^2) will be reduced to about 0.06 W/m^2. This paper indicates that when the Sun is at a zenith angle of 105 degrees (i.e. a while after the Sun has set), the sky brightness is about 0.1 W/m^2.